I’ve tried a cou­ple of photo acces­sories recently that I’d like to share with you because they make my life easier. 1 — The S&F deluxe tech­ni­cal belt by Lowe­pro. My wife picked this up for me recently as a gift and I’m lov­ing it. As men­tioned in pre­vi­ous posts and pod­casts, I’m a big fan of lens pouches and I use them almost exclu­sively (ver­sus car­ry­ing a cam­era bag) on most per­sonal photo shoots. Usu­ally I have 3 lenses on me and 2 of them are car­ried in lens pouches. Until a few weeks ago I sim­ply clipped the pouches onto an actual belt that goes through my jeans. It works well enough but get­ting into the jean pock­ets is dif­fi­cult and my wife felt I looked all dishev­elled espe­cially if I needed to wear a jacket. She was right. 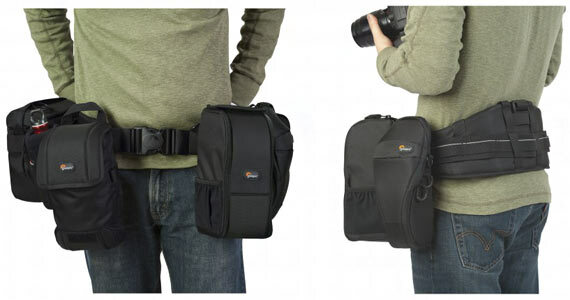 I have to say, the tech­ni­cal belt is WAY bet­ter than clip­ping the pouches to a reg­u­lar pants belt. It is so much more com­fort­able and you can see the solid back sup­port if offers, it’s a pure joy to wear. Espe­cially when going from shoot­ing to the car, the whole belt comes off in a flash with the pouches firmly secured onto them. If you do need to get into your pants pock­ets you just slide the belt around. In addi­tion, it looks and feels great when you have to wear a jacket. It might well be my favourite acces­sory of 2013. It can be pur­chased imme­di­ately at B&H in the USA or at the The Cam­era Store within about 1 week. 2 - Pho­toRe­pub­lik Twin Speedlite Holder — This acces­sory was loaned to me for review by our spon­sor The Cam­era Store and I find it to be an extremely well built acces­sory. Some of the com­mon gripes peo­ple have with flash hold­ing acces­sories are their over­all ‘dink­i­ness’ and that the actual point of con­tact between the flash and the hold­ing shoe is flimsy (read risky) and dif­fi­cult to con­trol. Good new or used flashes are at least 100–600 dol­lars, why would you want to attach it to a bracket with a flimsy flash shoe holder that looks like it costs less than a nickel. One care­less bump into the light stand can snag the bot­tom part of the flash right off. This twin flash holder is crazy solid in all respects and oper­ates smoothly. The point of attach­ment to the flash as well as the whole unit (except the knobs which are still very solid) is made of steel and oper­ates very smoothly to attach to your flash. It feels safe and that will make you feel more secure about the setup. There’s place for an umbrella holder and it tilts from front to back for eas­ier angling of light. It’s a per­fect attach­ment for shoot­ing with an umbrella when when you need more punch than one flash can offer.